If you are a big fan of popular US television series, then Hulu is definitely not a new word for you. Hulu is an American subscription based video on demand service that has a huge collection of premium video content. In partnership with MGM, Warner Bros and Sony Pictures, this video streaming site airs, current TV shows, films as well as full seasons of hit series. Hulu is also the only service that allows you to enjoy current season programs from the top most US broadcast network, the very next day of airing the new episode. If you are an Apple TV user and wish to enjoy Hulu on Apple TV, then the following given article will surely help you with best solutions. Read below and know how to watch Hulu on Apple TV. The Hulu services are available in different subscription packages like per month packages with limited commercials, and commercial free monthly package. Moreover, Internet connection is required to stream the content available on Hulu. In case if you do not have access to Internet connection or the connection is slow, then you can enjoy Hulu content by downloading and recording. The best way to download Hulu videos for free is by using downloader software like iTube Studio which is best in its category. iTube Studio is professional software that allows downloading the streaming content from over 10,000 sites, including popular names like Hulu, YouTube, Dailymotion, MTV, Vimeo, Vevo, Lynda and others. The software is compatible with over 150 video formats and can even extract MP3, M4A, AC3, WAV and other audio formats from video files. 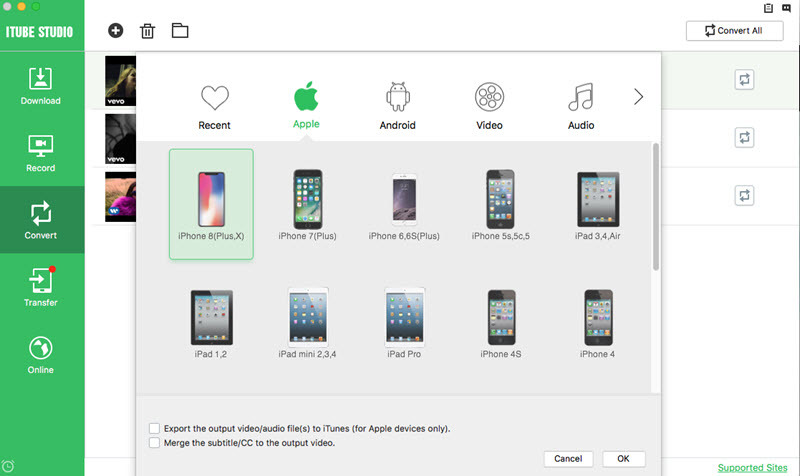 The downloaded videos on iTube Studio can further be converted to formats that are compatible with Apple TV, iPad and other devices. 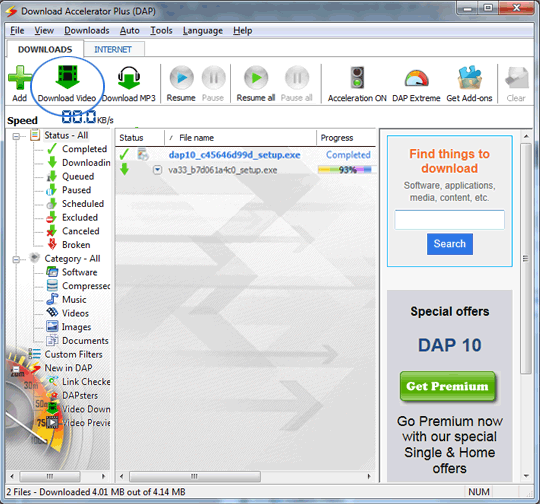 High quality HD video download is supported by the software and it also facilitates batch downloading. Thus using iTube Studio, you can download your favorite Hulu content, convert it to Apple TV compatible format and conveniently play your Hulu on Apple TV. Download videos from YouTube, Hulu, Facebook, Vimeo, and other 3,000+ pupular sites. Record screen or any video from online websites, like Hulu. Wish to get Hulu to Apple TV? Listed below are the steps to watch Hulu on Apple TV using iTube Studio. Step 1 Download Hulu on Mac with iTube Studio for Mac. Copy Hulu video link that you wish to download. Launch iTube Studio on Mac and click “+ Paste URL”. The copied link will paste automatically and the video will start downloading. Step 2 Convert Hulu to Apple TV friendly format. The downloaded Hulu video will appear under “Downloaded” tab. Beside the downloaded Video, click “Convert”. You will find the video on the Convert section. Then click Convert icon, click “Apple” and scroll down to select "Apple TV" and click "OK". The selected video will start converting to Apple TV compatible format. Step 3 Transfer the converted video to Apple TV and enjoy it without any Internet connection. 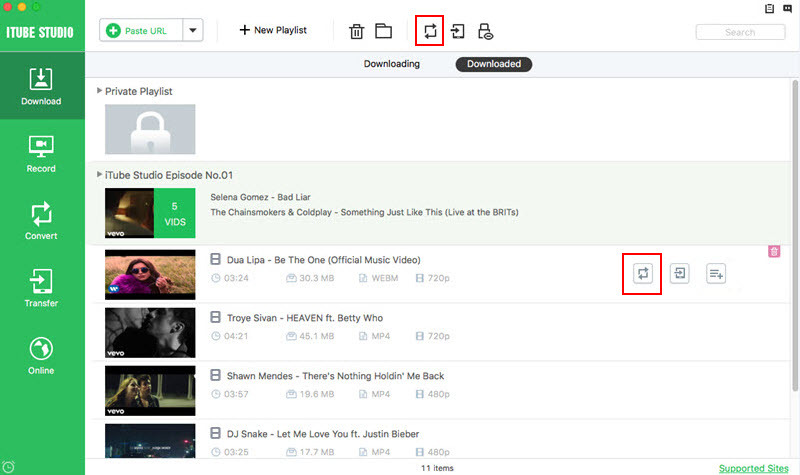 The above given screenshots shows process with YouTube downloading. But the same steps for Hulu content can be used. Hulu Plus app for Apple TV offers instant access to the hot new episodes and a series of popular shows, films and other content. 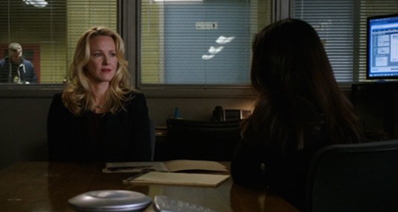 The app provides access to the latest HD episodes from CBS, ABC and FOX. The previous season of the interesting shows can also be enjoyed on demand using the app. For the kids, Hulu Plus app has great collection from Disney XD, Cartoon Network, Nickelodeon, Disney and other popular networks. 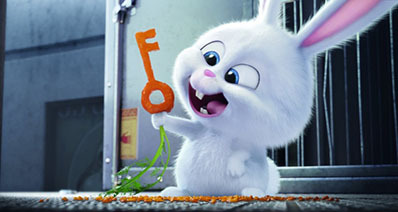 The App also features an option where you can put a Kids lock on the device so that children are restricted only to the kids' content. So if you are looking for options on how to watch Hulu on Apple TV, using Hulu Plus app is an ideal solution. On home screen of Apple TV, locate Hulu Plus app and enter the user name and password. Start streaming your favourite content instantly. 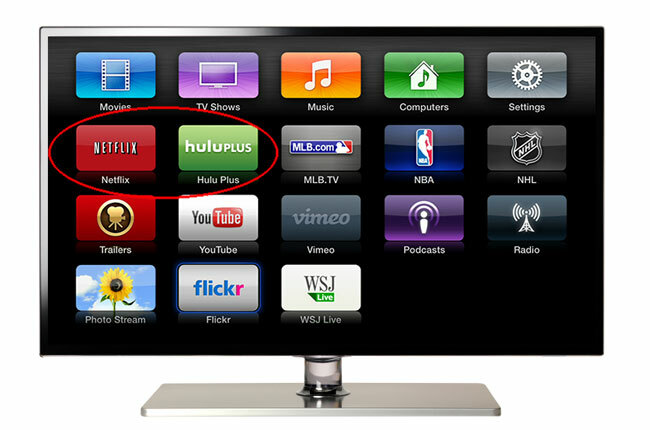 Note: In case if you are not able to see the Hulu Plus app, you need to restart your Apple TV. On your device go to Settings > General and then scroll down to the bottom and click Restart. Register online by going to http://www.hulu.com/start/appletv. Now launch Hulu Plus app on Apple TV. 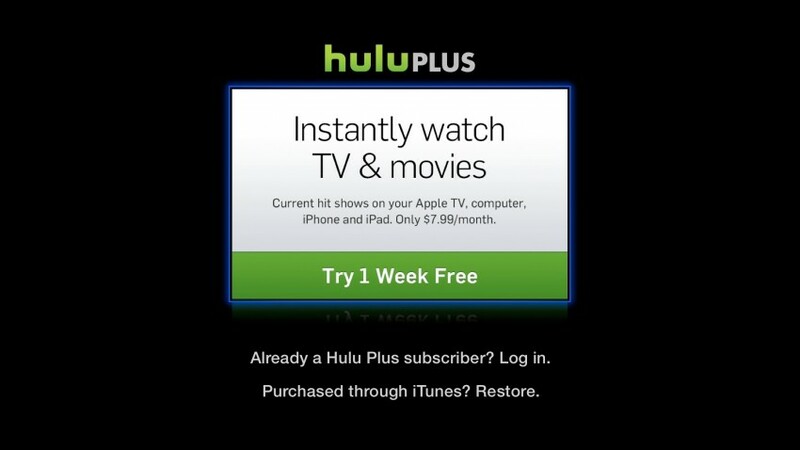 Existing iTunes account can be used to create Hulu Plus account directly through Apple TV. Note: The Hulu Plus service is only available in the USA. For the new users, one-week free trial service is available after which $7.99 per month will be charged for active services. If you are not residing in USA and wish to unblock Hulu on Apple TV in Canada, Australia, Germany, South Africa or UK then VPN or Smart DNS proxy method can be used. As the name suggests, Air Play mirroring is an iOS feature where you can exactly mirror what you see on your Mac or iOS device to your Apple TV. The feature works wirelessly and has device rotation and zooming function. For Air Play Mirroring to work, Mac with Mountain Lion or higher OS/compatible OS device, Apple TV (2nd or 3rd generation) and a good Internet connection with 1.5Mbps or more bandwidth are needed. Using this feature, Hulu content played on your Mac can be directly seen on your Apple TV. The sender and the receiver device during Air Play mirroring need to be in the same network. So now using this feature, you can play the free Hulu video through your Mac on your Apple TV. Before starting the process, ensure that Mac and Apple TV are connected to the same network. 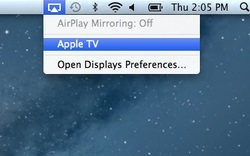 On Mac system, the menu bar will automatically detect the Apple TV in the same network. Enable AirPlay option on Mac system and select Apple TV from drop down menu. On your Mac system, play desired Hulu content and it can be seen on your Apple TV. So use any one of the above methods to get Hulu to Apple TV and enjoy your favorite content.